Oct. 15, 2006, 4:01 a.m.
A long time ago, we used to be friends, but I haven't thought of you lately at all. June 11, 2011, 1:47 a.m.
Nov. 1, 2006, 9:56 p.m. So it took me two months to get off my lazy behind (actually, given that I must sit down at a computer in order to color, does this mean that I must get on my lazy behind?) and color this thing. So it's rushed. So it's simple. And yes, I am working on trades...er, yes, I am. Oct. 22, 2006, 12:14 p.m.
Heh...love-child of Vitani and Kiara. 'Cause that pairing is awesome. Jan. 4, 2008, 8:04 a.m.
April 10, 2008, 11:35 p.m. Desperate unrequited love = Sappy, but fun! Take it from someone who knows, wounds around the eye bleed a LOT. Jan. 15, 2006, 6:54 p.m. Seven hours, twenty-two layers, and three headaches later, I bring you the greatest piece of art I've ever made in my life. If you only ever view one illustration in my entire gallery, make it this one. If you have ANYTHING to say at all about it, say! I'd love to know what you think about my best drawing yet! This is my first ever Nala, and best Simba! This is a picture of a happy Nala and Simba in love, sleeping on a tree. I hope this will one day have more faves than Simba/Alafin. April 23, 2009, 11:28 p.m. 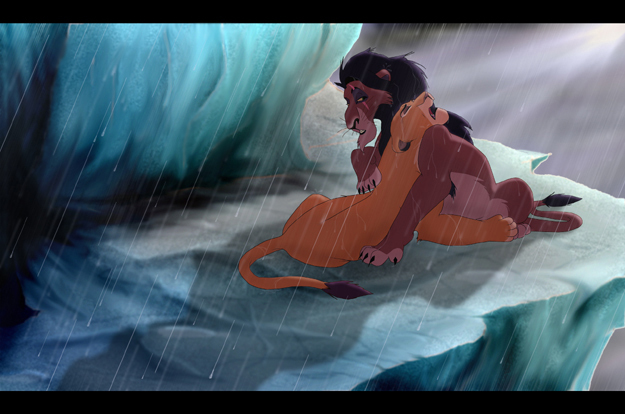 There was something absolutley amazing about Nala that Simba had never seemed to notice before. Wherever she moved his eyes followed. Her smile was the most presious expression he had ever seen on a lioness's face. He had missed his family and friends greatly and he didn't want to separate from Nala again, but at the same time he feared how much she would hate him if she knew the truth that he had killed his father. Nov. 5, 2010, 6:23 p.m. Anyway if anyone's still interested in points commissions on DA let me know! Feb. 13, 2008, 6:50 p.m.
See, when I'm finished with a picture, I don't really like holding onto it for very long. Maybe it's because I like to get things done in one fell swoop, and uploading is part of the process of "finishing" a picture. I don't know. Regardless, I'm sure it's Valentine's Day somewhere, so this will only be a wee bit early for the rest of you. So here's a pair of star-crossed lovers secretly lamenting over the fact that the artist is a lazy lump and didn't go into much detail but that's okay because she kind of likes it anyway and so they'd better learn to deal with it and not complain which they will never.